With 2019 National Signing Day set for Wednesday, one of the top stories nationally is whether Florida Gators head coach Dan Mullen will be able to close strong just as he did in the early signing period just two months ago. While the Class of 2019 did not get off to a huge start for Mullen, the Gators added a trio of key commitments to end the early period and enter signing day ranked 11th nationally in the 247Sports Composite team rankings. Florida enters the day with nine early enrollees, 12 players that have signed National Letters of Intent and two unsigned verbal commitments. As such, it is ranked 11th nationally and fifth in the SEC behind Alabama (No. 1), Georgia (No. 2), Texas A&M (No. 4), LSU (No. 6). But that does not mean the Gators are done. In addition to the two pledges that are on signing watch, there are a handful of uncommitted prospects that Florida has its collective eyes on entering the day. Let’s take a look at those commitment and remaining targets withe National Signing Day approaching. Four-star DB Kaiir Elam (North Palm Beach, FL): Florida’s top remaining target, Elam is ranked 48th overall nationally and has received plenty of attention from the Gators for the last few years. If his last name sounds familiar, that is because he is Matt Elam’s nephew, and Florida certainly hopes that his familiarity with the Orange & Blue plays a role in his commitment. 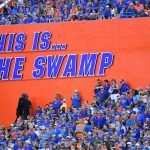 Kaiir Elam has long been projected for UF, but its chief rival has picked up a lot of momentum recently particularly as Georgia just swiped away Elam’s primary recruiter (Charlton Warren) as its new defensive backs coach. Torrian Gray simply does not have the same relationship, though Mullen and linebackers coach Christian Robinson hope to overcome the staff change. Four-star DE Khris Bogle (Fort Lauderdale, FL): Though he is currently committed to Alabama, it is believed that Bogle will be flipping on Wednesday to a program from the Sunshine State. The No. 71 overall player in the nation, Bogle has taken visits to Florida and Miami. Word is that the Gators impressed the family and remain confident in a signing day surprise. Let’s see if they pull it off. Four-star ATH Mark-Antony Richards (West Palm Beach, FL): One of the top playmakers in the nation (and the 90th ranked prospect), Richards is projected to be a running back at the next level, which is why Georgia is at least a legitimate contender for his services. However, this looks to be a battle between Florida and Auburn. If it is about relationships, Richards has a strong one with Tigers coach Gus Malzahn. 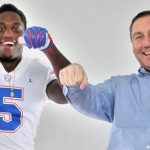 While the Gators have not pursued him as long, Mullen took a helicopter to his high school for a visit last week and put on a full-court press. It’s fair to say that UF put forward effort here, but expecting it to pay off may be foolish. This could be a cherry on top. Four-star DE Charles Moore (Louisville, MS): Mullen has long been after Moore, a former Mississippi State commit who is ranked 69th overall nationally. One month after visiting Auburn was all it took for Moore to decommit from MSU, and he subsequently took visits to UF, FSU and LSU over the following few weeks leading into signing day. There was a two-week span where the Gators felt great about landing Moore, but that does not seem to be the case down the stretch. Where he ultimately goes remains to e seen, but the 247Sports Crystal Ball heavily favors the Tigers. Four-star WR Arjei Henderson (Richmond, TX): Henderson, ranked No. 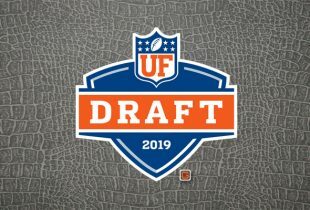 140 overall, committed to the Gators on Jan. 3 in a bit of a surprise at the Under Armour All-America Game, choosing Florida over Florida State, Georgia, LSU and Penn State. He cancelled his planned visit to FSU, and while UF was Henderson’s fourth commitment as a recruit, there is no indication that he will change his mind at the last minute. Signing time: 8 a.m.
Four-star LB Diwun Black (Kissimmee, FL): Black, ranked No. 151 overall, committed to the Gators before the 2018 season and never wavered from his pledge. He recently reaffirmed that he will be inking with Florida on Wednesday, calming any concerns of a switch. Signing time: 9 a.m.
Are any of our signees not yet qualified academically?